We present here a chess game we did invent ourselves. 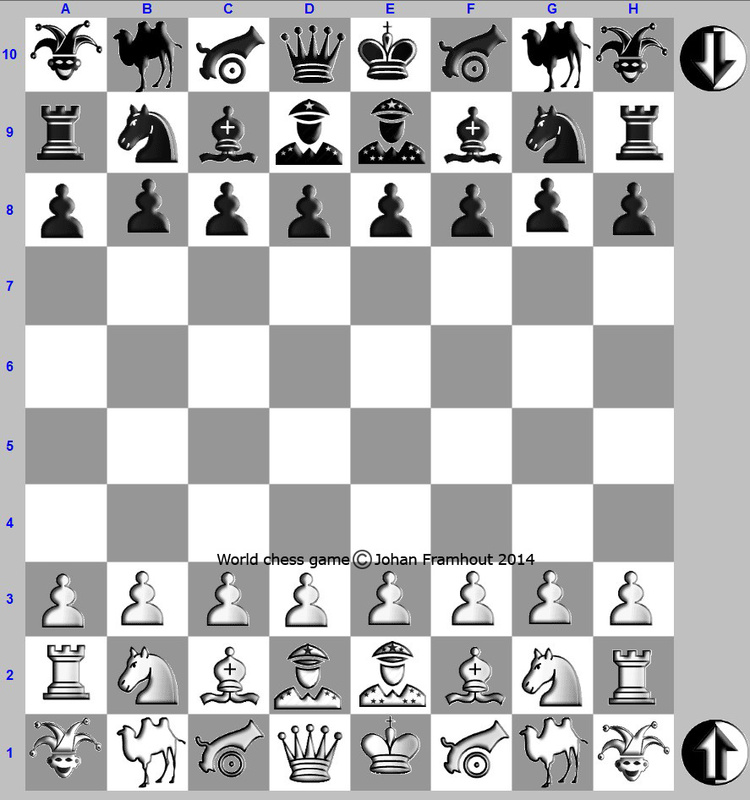 It is played on an orthodox chess board, 8 to 8. In this game the goal is to reach the opposite side. Capture is switching places. 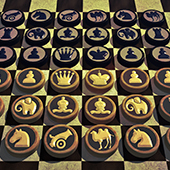 Except the orthodox chessmen, three pieces have been added: the cannon form the Chinese chess, the camel from the Arabian and the elephant from the ancient Indian chess. However, the elephant here is more powerful, it can also move orthogonal. It is the strongest piece. Playing it means fun and it also requires time thinking. 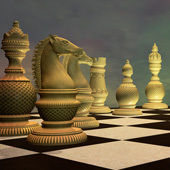 The orthodox European chessmen keep their capacities. 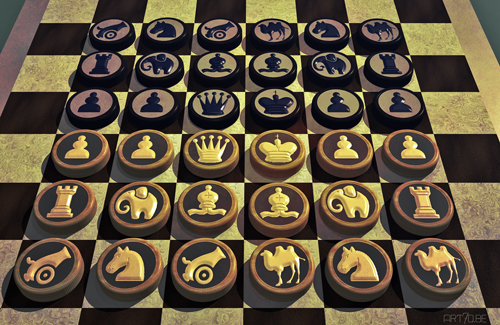 A pawn placed on the second or thirth row always can decide to make a double move forwards. 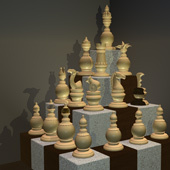 Castling, check and passant do not exist in this game. The cannon always leaps orthogonal over one and only one piece (white or black) to land on one of the fields behind it (moving as well as taking, so landing at an empty field or switching places with another piece). 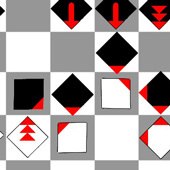 The camel moves (leaps) and takes as a knight, but 3+1 fields instead of 2+1. The elephant leaps 1 or 2 fields orthogonal as well as diagonal. (when the pieces are different) . 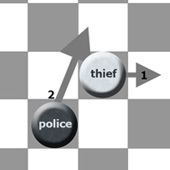 A pawn (of course) cannot move or take backwards. A move cannot be undone by reversing in the next turn. (If for instance the white bishop takes the the black one, they change places. In the next turn black cannot take this white bishop again.) Also larger loops must stop: when a number of moves is repeted (and both colours did move) the second move in the repetition has to be different. The pawns have to reach paradise on time.  At the same time one has to try to get it's chessmen past the pieces of the opponant. On this way it is possible to push the slow opponant pieces back. In the same way it is possible to make a big move forwards with one's slow pieces. For this purpose the elephants, camels and horses are most suited. bishop C3 x pawn F6. 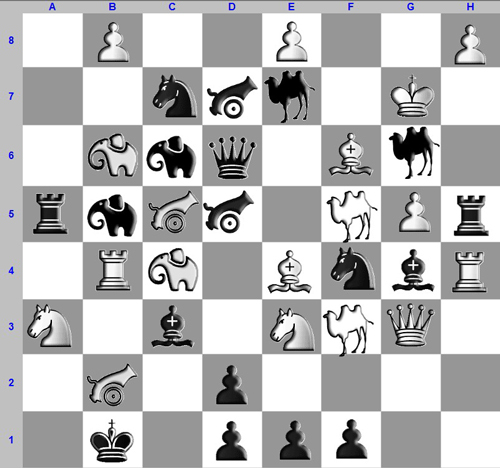 The white pawn so arrives on C3, a serious backlog compared to black. The black pawn on D2 is yet to get inside. 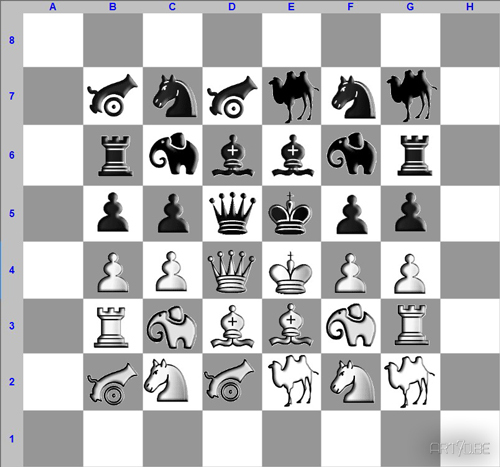 With pawn D2 x bishop C3 white can bring the black pawn to C5 with his cannon. Also possible to black is king to C1, next king C1 x pawn D2, after which the king himself has yet to return to his paradise. Unless you like sculpturing, the simplest way to play is with disks as on the picture above. You may stick printed images on for instance large buttons. What's new on art7d.be? Follow the blog!